Product Manufacturing Information or PMI as it’s more commonly known is a Digital Design & Manufacturing term for material information associated with a 3D design. Having PMI associations visible as an integral part of 3D PDF documents extends the reach in PLM reporting workflows. PMI, sometimes referred to as Geometric Dimensioning and Tolerancing (GD&T) includes material data, model views, dimensions, surface roughness, text and metadata of manufacturing specifications for others to be able to assess or replicate build. It was some time ago that designers moved away from 2D paper drawings to fully annotated 3D digital modeling using a variety of specifically developed CAD systems. Generating non-proprietary viewing facilities with PMI has been a very recent advance. Carrying along annotations, notes, markups and other non-geometric information is the key issue addressed by modern PMI implementations in interactive 3D PDF conversion systems. By presenting 3D parts and assemblies with associative interactive PMI visualization, significant time and cost savings throughout the design, planning and production processes of the supply chain can be achieved. The precise visual representation of 3D Font Metrics for text and manufacturing notations build on digital typography traditions, 3D interactive graphics and the latest Product Representation Compact (PRC) referenced in ISO-14739 and the full PDF file format specification ISO-32000. The advantage of following standards is wide-spread free viewing platforms most notably the Adobe Reader viewing a standardized PMI representation. Dramatically improvement of practical value is added by embedding metadata as text strings as well as visual presentations in 3D PDF. This enables re-use, search and a higher level of interaction. PMI maybe grouped and navigated according to view orientations, part hierarchy, layers or attribute. Fully associative interactive visual PMI may include highlight and hyperlink – where selected parts with annotations are switched to alternative highlight color or outline, and dynamic visibility of associated PMI is switched on. Part selection itself can be used to hyperlink to further documentation via bookmarks or even external URLs. The PDF3D-SDK exposes API methods for semantic PMI implementations for rich 3D PDF reporting features. 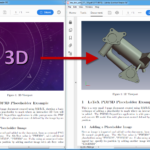 The good news is that as 3D PDF becomes the preferred choice for engineers, designers and man ufacturers to communicate their assemblies and product designs to a wider audience, there are now ways to present those models with the standardized PMI annotations. With PDF3D’s latest suite developers can now create applications to embed 3D models into reports that conform to ASME Y14.5-2009 symbology. To find out more about 3D PDF Reporting for Manufacturers and Engineers, please take a look at the PDF3D-SDK development toolkit. 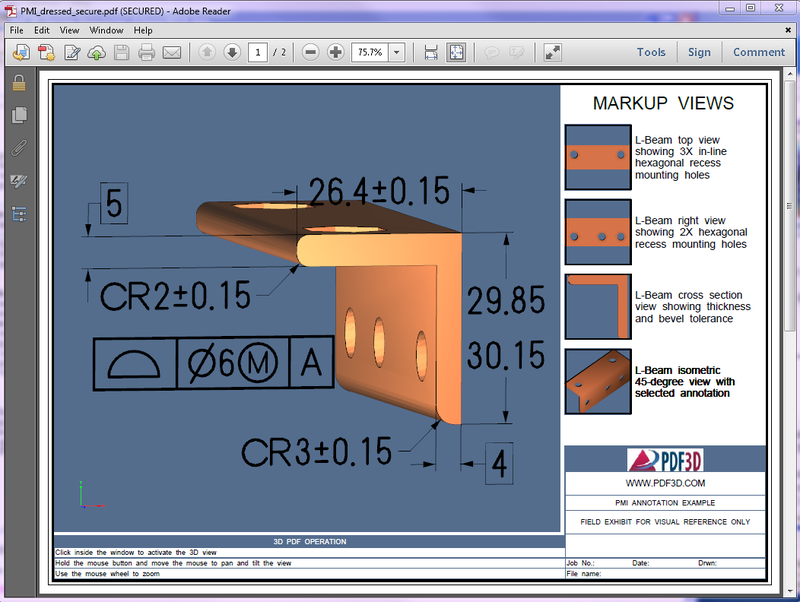 Examples of 3D PDF files with PMI Annotation encoding are available on the sample Gallery page.